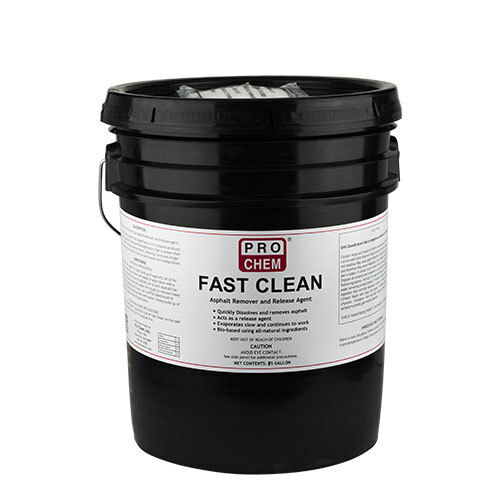 FAST CLEAN | Pro Chem, Inc.
FAST CLEAN is an asphalt remover that works better and more quickly than diesel fuel or citrus-based products for dissolving asphalt. The evaporation rate of Fast Clean is slower than diesel fuel and orange-based products so it can continue cleaning for a longer period of time. Penetrating deep to soften more tar and leaving less redeposition makes this product the perfect choice for all asphalt removing jobs. REMOVAL APPLICATION: Do not dilute with water. For light buildup of asphalt, let sit for 5-10 minutes, then spray clean with water or wipe clean with a wet cloth. For heavy buildup of asphalt, let sit until asphalt has softened, then spray clean with water. For tough-to-remove, heavy buildup, apply FAST CLEAN and allow to sit for 15-20 minutes. Use a stiﬀ-bristled brush to scrub the asphalt before spraying with clean water. 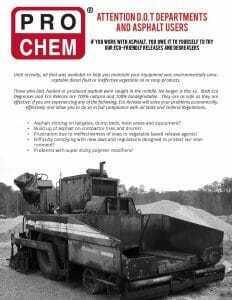 Heavy buildup may require a second application. Do not dilute with water.